Superficial damages to the natural tooth structures can undermine both their integrity and the overall look of your smile. Dental bonding is a relatively inexpensive treatment that can instantly restore chipped or cracked teeth to their former aesthetic beauty. This treatment can also bolster and protect weakened or damaged tooth structures, so that additional harm is less likely to be sustained. How Dental Bonding Works During the bonding process, a composite resin is applied to the tooth surfaces. This resin adheres to the teeth to conceal problems such as chips, cracks, natural imperfections and discoloration. It can additionally be used to fill in minor cavities and to restore teeth that have otherwise been compromised. Dental bonding is currently considered one of the most affordable and effective alternatives to porcelain veneers. Best of all, dental bonding can also improve how your teeth feel. It can be uncomfortable to run your tongue over cracked and ragged tooth surfaces or to have these constantly pressed into the cheek. Bonding creates a smooth and entirely natural-feeling surface so that chewing and talking are not uncomfortable. Easily And Safely Increase Your Confidence With Dental Bonding Dental bonding is not just affordable. It is also one of the shortest, restorative treatments that people can receive given that bonding can be completed in a single office visit. This treatment is also highly versatile and can be used to treat one tooth or all of them. Bonding can even be employed as part of a multi-pronged treatment plan that includes other restorative procedures. Best of all, unless bonding is being used for the restoration of a decayed tooth, anesthesia is rarely necessary. Most people realize that cavities are unhealthy, but many do not understand just how prevalent of a problem tooth decay actually is. The Centers for Disease Control and Prevention (CDC) now reports that as many as 19 percent of children and 26 percent of adults have untreated cavities. When left untreated, tooth decay can cause a variety of aesthetic and medical issues that will require comprehensive treatments. These are just some of the reasons that everyone should know about the importance of regular dental treatments and how important annual appointments are when it comes to finding and treating cavities. The easiest way to describe a cavity is a hole in one's tooth. These will develop in a number of stages beginning with harmful bacteria being left in the mouth. Certain substances such as sugar will cling to teeth and gums after being ingested. When it is not removed by brushing or flossing, then these different substances will develop into harmful bacteria. In turn, this bacterium will eat away at the outer layer of enamel on the teeth. Cavities occur when the damage has penetrated the outer layer of the teeth, but there are quite a few different types of damage that can take place with tooth decay. Crowns or Fillings: Which One is Better? Restorative dentistry offers patients a way to repair their smile both aesthetically and functionally. It can mean the difference between a tooth that hurts to use and one that exists free from pain while looking just like a natural tooth would. The problem is that patients are routinely given a choice between fillings and crowns. Before you choose one or the other, it's important to understand which of the two is best to use. The short answer is that crowns and fillings have certain uses where they perform better. This is why both are still utilized in modern dentistry. When Do Fillings Work Better? The first and foremost difference between fillings and crowns concerns cost. Fillings are generally cheaper, as they can range between $50 to $300 for silver amalgam fillings and $90 to $450 for composite resin fillings. Fillings also typically require significantly less healthy tooth tissue to be removed. 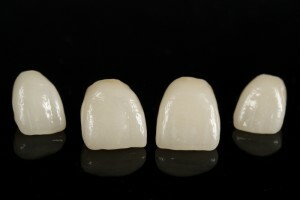 Composite resin fillings require the least tissue to be removed, as they are chemically bonded to the teeth by UV light. Silver amalgam and similar types of fillings require the dentist to create a shape for the filling to sit. This makes fillings ideal for fixing small spots on the teeth where decay has occurred, which in turn can prevent decay from spreading and eventually killing the tissue inside of the tooth. When people hear that they have a cavity, they are often surprised because it doesn't hurt. The truth is that cavities do not always cause pain, and there is a simple explanation for this. The Decay Process Explained A tooth that is in the early stages of decay does not necessarily hurt. The enamel is the hardest portion of the tooth and does not contain any nerve endings, so decay in this area does not cause pain. The next layer is the "dentin." Dentin isn't as hard as enamel, but it also does not contain any nerve endings. Therefore, decay that reaches the dentin doesn't cause pain either. When Pain Begins The pain begins when untreated decay reaches the tooth's pulp. At this point, you may experience pain when you bite into your food and/or ingest hot or cold food or beverages. It may even be very painful when you are not eating or drinking. Sometimes, untreated decay infects the nerve and causes an abscess to develop, and this is what causes throbbing pain. Once you have reached this point, it will be too late for your dentist to treat the cavity with a simple filling. Root canal therapy will be required to remove the infected soft pulp of your tooth. With costs ranging from anywhere from $45 to $150, it is a little bit easy to compare getting a facial treatment with a tooth filling. If you have an hour or a little more and some cash to spare, which should you go see first – your derma or your dentist? What happens if you don’t get a facial treatment? Most of us have survived throughout life without ever having had a facial treatment. This deep cleansing procedure is done tone, exfoliate and moisturize and revitalize skin on the face, neck and shoulders. Facials are helpful because they treat, correct and prevent common problems like excess sebum production, dryness or acne formation. Both are suited to people on the go because under the hands of a qualified dentist, these can be finished in as little as two visits. Both are made from thin and porous porcelain, are stain proof, natural in appearance, durable and resilient. They are also designed to last for years if coupled with proper home care, cleansing and regular visits to the dentists. However, these are recommended only for minor cosmetic adjustments and not for serious dental makeovers or orthodontic work. They are best for minor tooth imperfections like covering visible portions of the teeth, straightening and lengthening teeth and concealing stained or discolored fillings. Dentistry has come a long way since the days of painful drilling and metal fillings. Dentists now not only take care of decay and other interior tooth problems; they perform many cosmetic services to approve tooth appearance. In fact, many dentists now specialize in restoring and maintaining a patient's beautiful smile. Not so long ago, porcelain veneers were reserved for actors and the wealthy who could afford to pay for snow white perfect teeth. Now the general population has access to porcelain veneers, meaning a Hollywood smile isn't limited to California anymore.